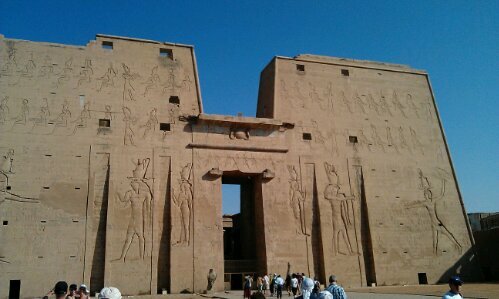 The day started with a ride in a horse drawn carriage to the Horus temple in Edfu. The ride was bumpy but what I completely underestimated was the horse hair. I’m allergic to animal hair. I know that. But I seemingly forgot that horses are animals and arrived at the temple sneezing. Fortunately it wasn’t too bad and so I also survived the trip back. It also showed me that a carriage ride wasn’t a desirable adventure (also because the driver was quite annoying, asking for Bakschish, meaning a tip, again and again. We finally gave him money just to shut him up even though this was something they warned us against because they get paid by the travel agency). But other than that the temple was quite interesting to look at. 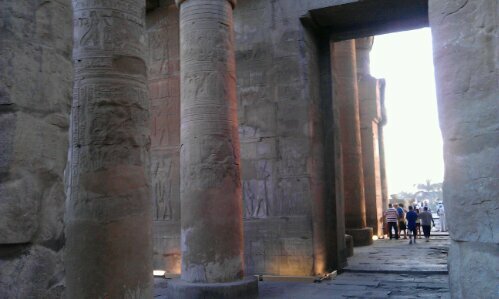 It is supposed to be the best preserved temple in Egypt and so it had a real hall and not only collumns without a roof. But after the decline of the Pharaonic times early Coptic Christians had destroyed most of the pictures and reliefs on the wall, evening out the faces of pharaohs and gods so the carving were not as amazing as they used to be. But we didn’t linger long (which was good because it also meant we had to get back to the ship quickly and could get away from all those annoying souvenir sellers. Yes, I know those people try to make a living but waving goods directly in my face, following me for quite some time and excepting no “NO” makes me want to sceam and curse but not to buy anything) and of we where on the Nile again. In the late afternoon we arrived in Kom Ombo where the temple is directly on the Nile where the ships moor. Here we visited the double temple, built as one but like a split house: one part was for Horus, his wife and his son and the other for Sobek, his wife and son. What was very beautiful here was that we arrived shortly before dusk and as it quickly grew dark we could admire the beautifully lit temple. Back on the ship we drove on to Aswan where we arrived late at night. 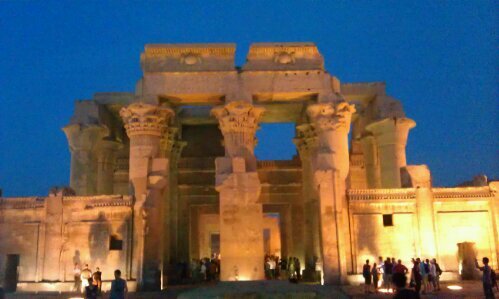 This entry was posted in Egypt and tagged Edfu, Kom Ombo, Nile cruise, Ruins, Temple by kathatravelling. Bookmark the permalink.